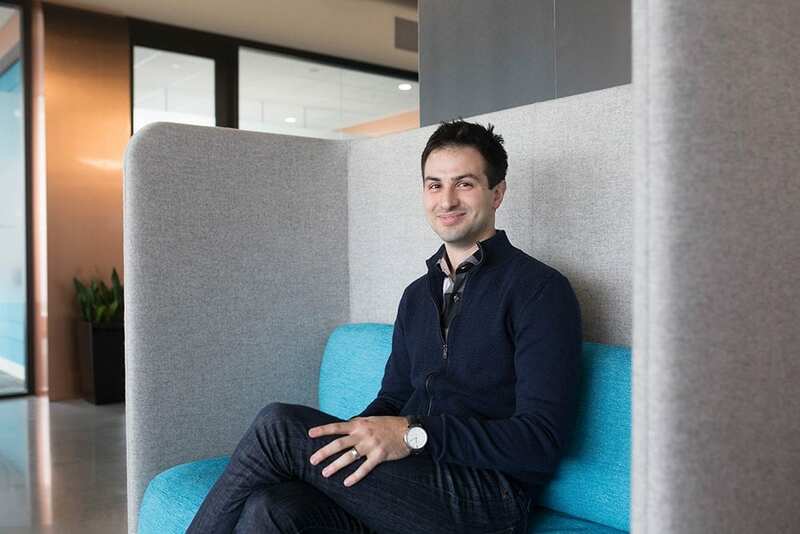 At first glance, it looked like your typical office inspiration, but for Marc Fiume, the co-founder of that startup, DNAstack, the print meant a lot more. Marc’s best friend, Dan, was born with cystic fibrosis. “If you’re unlucky enough to receive a broken copy of one gene from your mom and one broken gene from your dad, you have this disease,” Marc explains. Due to extensive lung damage resulting from the disease, Dan has had two double lung transplants. Dan also has the hand and lion print — inspired by the biblical story of Daniel in the lions’ den — tattooed on his chest. DNAstack has since moved out of its basement office (and lost the print to construction damage), but Dan’s lion-like bravery continues to inspire and drive Marc. Born out of that U of T incubation space — and Marc’s PhD thesis — DNAstack develops artificial intelligence–powered software designed to unravel the human genome in the hope of improving the lives of people like Dan. 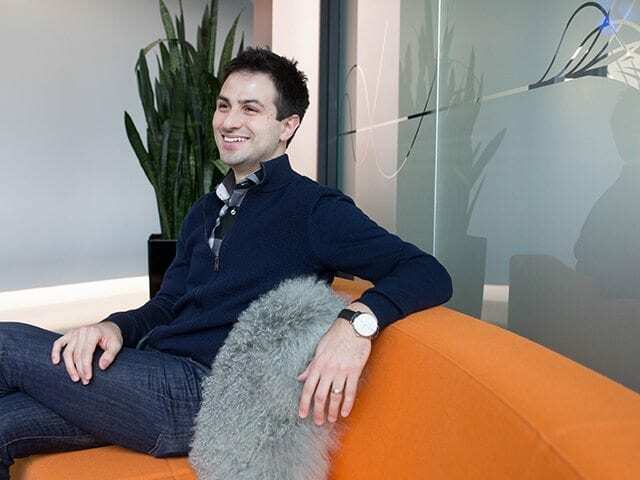 Marc was inspired to build the company when he realized that the intersection of biology and computer science could make this kind of lasting change happen. Cystic fibrosis is only one of countless diseases that are genetically linked. When it comes to genetic disease, “it’s actually a very common problem. If you talk to anyone, within one or two degrees of separation they have someone in their family, or someone close to them, who’s affected by a genetic disease,” explains Marc. While it’s becoming less expensive to sequence our genomes, with six billion letters in each person’s genome — generating 200 GB of data — we’re currently unable to both store this data and make sense of it. In order to make use of genomic data, we need to first put it all together and then start comparing sequences to uncover patterns. DNAstack uses the power of the cloud to address the storage issues of genomics and harnesses the advances in artificial intelligence (AI) to start to make sense of all that data. But putting genomic data together is not as easy as it sounds. First, it’s an absolutely massive amount of data. Second, there are myriad privacy and security issues surrounding the storage, transfer, sharing and use of genomic information. In response to these challenges, Marc and DNAstack have partnered with leaders in cloud computing, sequencing, software and security to form the Canadian Genomics Cloud, an advanced public cloud platform that allows researchers from across the country to securely store, share and analyze genomics data to further their discoveries. The platform has two key benefits: it’s cheaper (instead of each research facility purchasing the infrastructure to store and manage data, they can use the cloud infrastructure); and it’s accessible (any researcher or scientist can access award-winning technologies from anywhere in Canada). The Canadian Genomics Cloud is currently deployed on Google’s cloud computing facility in Montreal, which means it’s linked with some of the world’s top AI brainpower. (Toronto’s Geoffrey Hinton is leading the team integrating the best of machine learning into the Google cloud). This is where that second aspect—comparing sequences to discover patterns—comes into play. “Suddenly the best machine-learning algorithms on the most powerful infrastructure in the world can be run with the push of a button on your genomics data,” explains Marc. The impact could be game changing. When it comes to healthcare, so much will be learned from connecting people’s genomes to their clinical records. We could apply machine-learning algorithms to determine which genetic markers predispose patients to certain diseases. Then, by stratifying people based on their response to medications, we can start to develop treatments targeted to specific genes or people. Considering how genomics is already advancing precision medicine — and providing treatments or cures — Marc hopes that in 10 years diseases like cystic fibrosis will be virtually eliminated. Precision medicine will change the lives of many others like Dan in the future — and Marc is excited and thankful for that. “It’s such a gift and privilege to be part of the ecosystem that’s moving this forward,” he says.